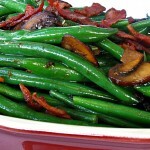 us year-round, this flavorful and colorful side dish can be served with any main dish, anytime of the year. Bring a large pot of water to a boil. Add the beans and simmer for 2 minutes. Drain. Melt the butter in a large sauté pan. Add the shallots and sauté for 3 minutes more.